Finally! The research I've been waiting for my whole life. “Our findings appear to add to a body of information suggesting that the composition of calories, not just the number of them, matters for determining their ultimate impact on weight,” Beatrice Golomb, associate professor in the university’s Department of Medicine, said in a news release. “In the case of chocolate, this is good news – both for those who have a regular chocolate habit, and those who may wish to start one." 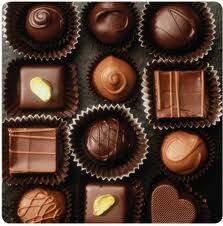 Read this short article if you're a true chocolate lover.